The day they no longer considered themselves brothers was the beginning of the end for one of them. Fate was caught up with them. The fight untill die between Itachi and sasuke couldn't stopped anymore. Genjutsu Vs genjutsu, sharingan power action. See the other wallpaper of Itachi and sasuke. This wallpaper is available too for friendster layout, friendster comment, friendster wallpaper, my space layout, my space comment, windows XP or Vista wallpaper, and dekstop wallpaper. 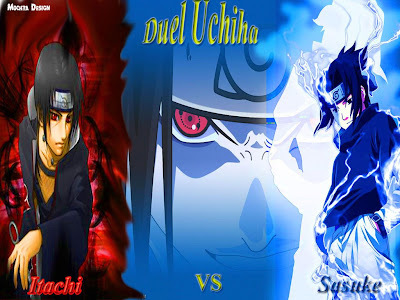 Get this Itachi versus Sasuke Wallpaper by clicking on image.